The sky is blue. The grass is green. Humans need food and water to survive. Well, unless you believe a story published in several major news outlets over the past week. Akahi Ricardo and Camila Castillo, a so-called "breatharian" couple, were spotlighted in widely-shared news articles claiming that they are able to survive off "the universe's energy" and refrain from eating, save a piece of fruit or vegetable broth three times a week. "Humans can easily be without food -- as long as they are connected to the energy that exists in all things and through breathing," Castillo was quoted as saying in one article. "For three years, Akahi and I didn't eat anything at all and now we only eat occasionally like if we're in a social situation or if I simply want to taste a fruit," she said in another quote. "With my first child, I practiced a breatharian pregnancy. Hunger was a foreign sensation to me, so I fully lived on light and ate nothing." The claims, which Ricardo told CNN on Tuesday the couple stands by, obviously defy all known science pertaining to the human body. Snopes, a website that fact checks internet rumors, snarked that it was "unable to find any evidence contradicting the body of science demonstrating humans require water and food to stay alive." Other people who have claimed to be breatharians in the past have been found to be eating. Jasmuheen, a woman credited as the founder of the breatharian practice, was once seen by reporters with a fully stocked fridge (she said the food belonged to her partner) and was caught ordering an in-flight meal (she said she wouldn't eat it), according to a profile in The Guardian. But none of that stopped this story from spreading quickly through the internet, with the couple's claims largely presented as unquestioned fact. Yahoo, The Sun, The New York Post, The Independent, The Daily Mail, Metro and a number of other outlets ran stories on the couple's supposed diet. The Independent's story was shared approximately 37,000 times. The Daily Mail's was shared about 24,000 times. CNN traced the story's genesis to News Dog Media, a UK-based content creation company that packages and sells tabloid-style news stories to media outlets. Matt Growcoot, a representative for the company, told CNN that News Dog Media conducted "two long interviews over Skype" with Ricardo and Castillo, then sold stories to several news outlets. (Upon purchasing the story, the outlets can re-write and edit the article to match their own style, Growcoot said.) Growcoot, who declined to provide the amount the outlets purchased the story for, said his company found the couple through the breatharian school they run. Asked if News Dog Media fact-checked the couple's claims in any way, Growcoot wrote in an email to CNN, "Short of flying to Ecuador and monitoring what they eat for a few weeks, I feel we did everything in our power to stand up the story. We're a small freelance outfit in the UK and clearly can't afford to fly to South America." It's not clear which outlets News Dog Media sold its story to, but The Sun, Metro and The Daily Mail all credited photos to the company. The Sun and The Daily Mail are also listed as clients on News Dog Media's website. The Sun appeared to be the first major news organization to publish a story about the "breatharian" couple this month. From there it went viral and was aggregated by a number of media outlets. Yahoo7, an Australian outlet affiliated with Yahoo, published a less-than-skeptical story claiming the couple had "hardly eaten in the last NINE years." "Food - it's a source of comfort for some, a way to socialise for others, but also a way to simply exist," wrote Yahoo7 reporter Allison Yee. 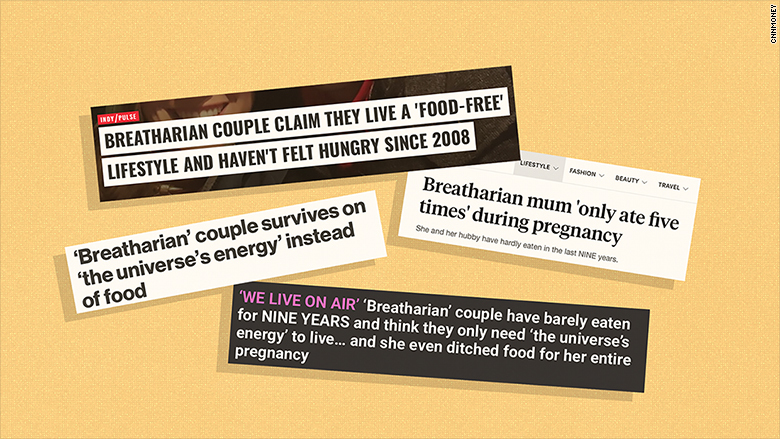 "Not for 'Breatharian' couple Akahi Ricardo and Camila Castello who follow a 'food-free lifestyle' and believe they can sustain themselves using energy from the universe." Yahoo News' Facebook page, which has 7.3 million followers, then shared the Yahoo7 story. Asked by CNN why the company would share an easily-debunked story with its large audience, a company spokesperson declined to comment. Shortly after CNN contacted the spokesperson, however, the Facebook post was deleted from the Yahoo News page. Yahoo's Style and Beauty page, which boasts 2.2 million followers, left a post on the couple up. Representatives for the The Sun, The Independent, The New York Post, The Daily Mail, and Metro did not respond or declined requests for comment. After it was contacted by CNN, however, The New York Post published a separate story refuting the couple's claims. Yahoo7 also published a similar story debunking the concept. "'Breatharian' no-food diet claims are a bunch of hot air, experts say," declared the headline for the New York Post's story. Zuckerbrot has a point. While this is far from the first fad to go viral on the Internet, refraining from eating food for long periods of time could obviously have dangerous consequences. On several occasions, The Guardian and others have reported, individuals attempting to follow the breatharian method and teach their bodies to live without food or water have died. But the stories in the press have nonetheless generated interest in the idea. Ricardo told CNN that since his story "got to the mainstream" he has heard from thousands of people "who have [expressed] interest or are curious about it." Ricardo said he wouldn't recommend attempting to starve the body of food without the proper "training" but insisted that with the "proper tools and awareness" the practice isn't harmful. "We all know the air is light. We all know there is energy in nature," he told CNN. "So there's no way this can be dangerous." Asked to respond to critics from the scientific and medical community who stress the practice is in fact dangerous and that it's not possible to survive without food and water, Ricardo said, "It's not possible when you don't have the state of mind. When your mind doesn't believe it's possible, it won't be possible." The laws governing the human body, of course, may beg to differ.